This is the type of show that makes you wonder what the writers were smoking when they created it. Son of Zorn is a comedy about… well the son of Zorn. And who is Zorn? You ask. 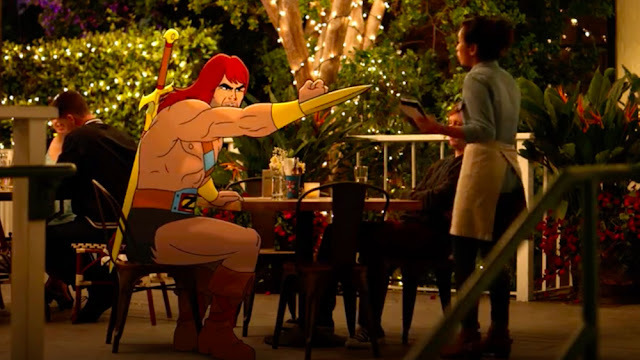 A He-man type cartoon character [yes cartoon], who was briefly married to a human woman but left her to go back to cartoonland and fight monsters or dragons or something like that. However, Zorn decides that it is time to reconnect with his son and spend some time in suburbia. The premise is just so ridiculous it is impossible not to laugh; however, I can’t decide if this show is genius or if it will become annoying after the novelty wears off. The jokes weren’t extraordinary, but they were generally well delivered by the actors. Plus, I like the magic realism tone they have going. It is funny that no-one seems to be fazed by the cartoon man walking in the middle of the street. I’ll file it as a good show for now. Should you watch it? If you mostly like traditional comedies like Modern Family, this is not your show. But if you are into quirky/weird stuff give it a go. I also really liked the episode a lot. I watched it two times already and can't get it off my head. Really loved the play and the story line with the amazing twists.